During the Pre-Fall 2014 shows, Anouk Hagemeijer breezed into the castings for Oscar de la Renta with a self-assurance and natural charm which was discernible from the get go. 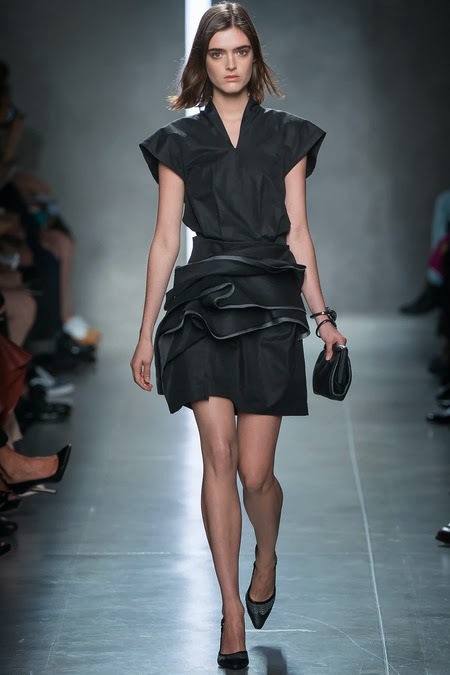 Twenty-four year old Hagemeijer's confidence is understandable given her stunning breakthrough moment during the recent Spring/Summer 2014 collections which saw her turning heads as an exclusive for Calvin Klein and at a raft of runway appearances for Marni, Bottega Veneta, Christopher Kane, Just Cavalli, and J.W. Anderson. With her shoulder length bob, diminutive 175 cm frame, and striking heavy set brow, Hagemeijer was one of the most instantly recognisable faces of the Spring/Summer 2014 season. Since being discovered in 2005 at the Elite Model Look competition, Hagemeijer's path to success has been paved by good old fashioned grunt modelling, invaluable professional and life experience, and a major image overhaul which has galvanised the attention of key industry players. Hagemeijer's versatile beauty has generated a discernible buzz amongst casting directors, stylists, and photographers in recent editorial shoots for Dazed & Confused, Vogue Italia, Indie Mag, and in test shoots with photographers William Lords and Matthew Priestley. Amongst a sea of pretty faces, Hagemeijer's strength lies in what she brings to the fore in terms of her charismatic personality, her relaxed cool girl vibes, and the ability to convey emotional intensity through the camera's lens. Hagemeijer's model as muse propensity has made her a clear choice for the visionary designs of Christopher Kane, J.W. Anderson, and Marni amongst others. Armed with a Bachelor in Medicine and an enquiring mind, Hagemeijer displays an elegant mature beauty and a well-evolved sense of self which is certain to provide plenty of inspiration for the fashion elite. Hagemeijer took time out to chat with IMA exclusively about her fascinating modelling trajectory, the image overhaul that has propelled her into the spotlight, and what inspires her in the realm of fashion, modelling, and beyond. 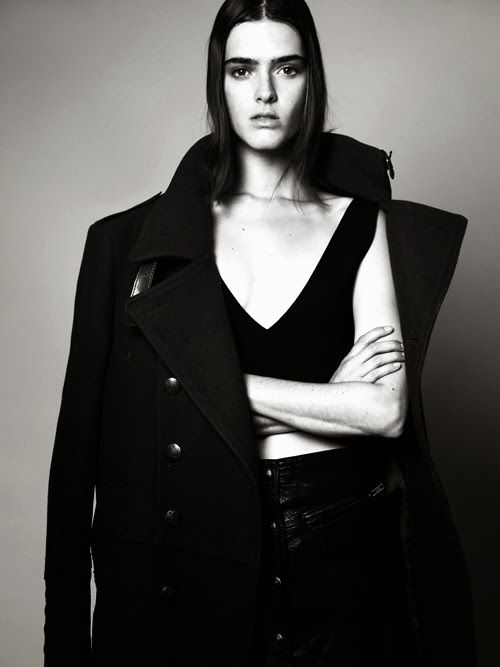 Inoubliable Model Army (IMA): Hi Anouk, thank you for chatting with IMA and a super congratulations on a stellar Spring/Summer 2014 season. Your show list included turns on the runway at Calvin Klein, Christopher Kane, Julien MacDonald, Just Cavalli, Bottega Veneta, and Marni! Were you pleased with how the Spring/Summer 2014 season unfolded and what do you feel were the key factors which led to this breakthrough moment for you this season? Anouk Hagemeijer (AH): Hello IMA, Spring/Summer 2014 was definitely my breakthrough and I'm really grateful for all the beautiful moments I experienced. It was a unique journey. A key factor has been a switch of representation of my mother agency. Almost two years ago I signed with Ulla Models in Amsterdam. They have prepared me really well and pushed me in the right direction. A personal trainer, a new haircut, and a great new agency in New York, DNA, were all stimulating factors to boost me career to the next level. IMA: You've been consistently modelling since 2008. Would you mind filling IMA on some of the gaps? AH: I started in 2008 just after I finished my high school in Delft, where I am from. I travelled for almost two years. In 2009, I decided to move to Amsterdam and started my Bachelor of Medicine at the University of Amsterdam. At this time I was still modelling on the side, but it was more difficult to travel. I achieved my Bachelor degree after three years. During the third year of my studies, I switched mother agency. Work started to pick up and in the end I was only able to study and write essays in trains and on planes! As the potential was there, I was enjoying it a lot and the feeling was right - I decided to quit my studies and after attaining my degree in 2012, I became a full-time model again. Now I am 24 years old. I would say I am currently based in Amsterdam as my apartment and friends and family live there. But the fact is that I am travelling almost all the time between London, Paris, and New York. I was discovered in the Elite Model Look in 2005. My friend signed me up for the contest without me knowing, and before I even realised I ended up in the finals with the last ten girls. IMA: Earlier this year, you went through a major image overhaul which involved cutting your shoulder length hair into an androgynous nape-grazing bob. How did the idea for the new look come about and did you have initial reservations? AH: It was a decision made by myself and my agency. I found my hair really boring and wanted something more interesting. Ulla proposed to cut it and also to darken it a bit. I agreed immediately. I was ready for this. So it was a done deal. Nowadays my hair is still shorter but I have my natural hair colour back, and also a little asymmetrical cut has snuck into my new look. 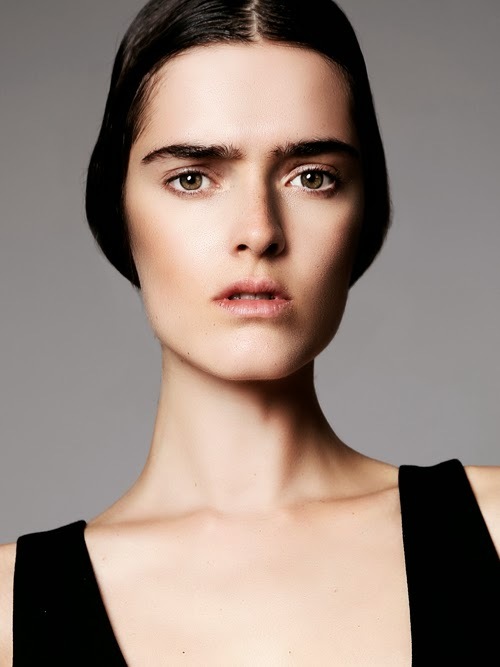 IMA: Suddenly this season, you along with Brasilian model Christina Herrmann who also sports a similar short bob, were the two edgy androgynous girls on every casting directors must see list. Do you feel different with this new look and were you surprised by the overwhelming positive industry response? AH: Chris and I did cross each others paths a lot this season. Some girls said we are like sisters, but Chris is the blue-eyed version and my eyes are green. I do feel different with this new look. It suits my face much better and it is more me, Anouk. Of course, I was surprised by the positive response as I had no expectations at all. IMA: You landed a Calvin Klein exclusive this season which set you up for a stellar run through the remaining three fashion capitals. What was involved in the casting process with Maida & Rami, and do you recall what you were doing and your initial reaction when you discovered that you had been confirmed for the show? AH: A few days after my casting for Calvin Klein, I had a call back. I jumped into a taxi and went back to CK. After doing the call back I walked back to my apartment. Walking up 8th Avenue my booker from DNA called me. He said without giving anything away, "Anouk stop going to castings, you are confirmed for a Calvin Klein exclusive!" Honestly, I had to lean against a wall and could not speak the first few seconds. Then I started screaming and could not believe this had just happened. And YES, there were also a few tears of happiness when I passed by the agency to meet with them hahaha! 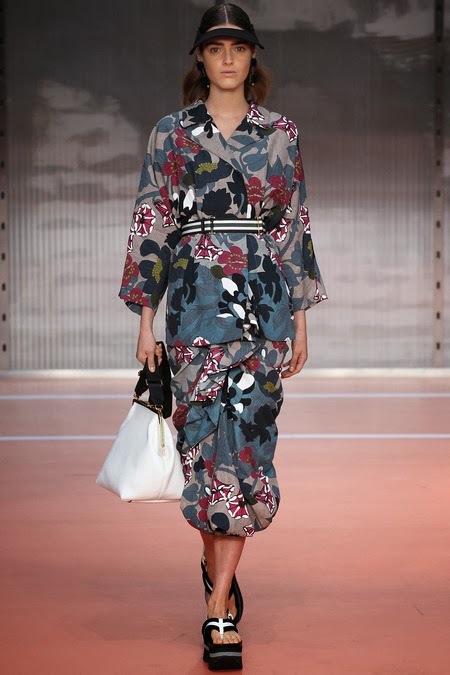 IMA: You displayed stunning versatility at Calvin Klein, Bottega Veneta, Christopher Kane, Marni, and Julie MacDonald. What do you enjoy most about the runway component of modelling and what were your most defining moments of the season? AH: My most memorable moments were Marni (during my Birthday), Christopher Kane, Just Cavalli, Bottega Veneta, and of course Calvin Klein. I really enjoy the moment before you enter the catwalk and the realisation of doing the actual show. You have to give everything you've got in that two minutes you appear on the runway. That gives you such an adrenaline rush, it feels amazing. IMA: The casting process can be particularly confronting not to mention exhausting with so many newcomers and established models vying for limited runway slots. What was your approach heading into castings and do you have an interesting anecdotes to share from your casting experiences this season? AH: I had no expectations at all. Actually I felt really relaxed. There is nothing to lose, and only things to gain. I approach a casting as myself, Anouk. Hello, this is me, a twenty-four year old Dutch model who is enjoying life and that is what it is. I have been to many, many castings. It is always nice to see girls you know, you can chat all the time and that makes the waiting go faster. The casting for BCBG was one big party haha! All the girls got a bag with goodies inside and there were cameras all over the place. IMA: Your resumé includes editorial appearances for Vogue Italia, Dazed & Confused, Gioia Magazine, V, French Elle, Tatler, and i-D Online. What has been your favourite editorial shoots to date and are there any key industry figures that you would love to collaborate with in the future? AH: For me the "Disturbia" shoot for Dazed & Confused is my favourite. Doing this shoot was so incredible. Being part of such an amazing creative process is fantastic. I am a great fan of Peter Lindbergh's work, and also of Tim Walker and Steven Meisel. It would be an honour to work with one of them in the future. IMA: A model's personal style plays a key role in showcasing her personality when meeting with clients and is gaining even more significance with the emergence of street style photographers and bloggers. How would you describe your street style and which three designers best embody your fashion aesthetic? AH: I am a huge fan of skinny jeans and tank tops. Combining this with a great denim or leather jacket would be a good description of my style. I like minimalism, elegant, and modern clothes. I can never resist the temptation to enter the stores of Helmut Lang, Alexander Wang, and Céline (Phoebe Philo). These designers really inspire my style. IMA: IMA loves the recent test shoots you did with William Lords and Matthew Priestley. What was it like collaborating with these two incredible emerging photographic talents? AH: I'm also really happy with the results from these two test shoots. The funny thing is, that I shot both tests shoots on the same day. In both shoots, I did not wear any make-up and yet they look so different. I really like Matthew and William's lighting techniques. Both are great individuals and I really have a lot of faith in their careers. IMA: What are the most valuable life lessons that you have acquired from your exposure to the modelling industry? AH: The modelling industry is hectic. Your life is scheduled in travel and work, and you are living out of a suitcase for many weeks. I realised that if you are happy in life, it is a lot of fun. And having a good base, like a home and friends and family where you can return to, gives me always so much energy during my work and travels. You have to stay true to yourself and find a good balance between work and your social life. IMA: The Netherlands has one of the most multi-ethnic populations in the European region. Do you feel that ethnic diversity should be reflected in fashion? AH: I love ethnic diversity. And I do realise that fashion designers take into account that there is ethnic diversity in their shows. For me it is an enrichment for the total picture of a show and also for the beauty ideal. IMA: Holland continues to be a major driving force in modelling with Dutch girls ruling fashion's runways. Who are your model besties and did you run into many Dutch girls in between the mad rush of castings, fittings, and shows? AH: I hang out a lot with Agnes Nabuurs (who is also my close friend in Amsterdam and we have been friends for many years even before we became models), Anne Verhallen, Milou Sluis, Lisanne de Jong, Charon Coojimans, and Nina de Raadt. I also really like Cato Van Ee and Iris Van Berne, it is always a laugh with them. It's lovely to run into familiar face, there is always something to talk about and you give each other energy. IMA: What do you find most gratifying about modelling and what profession would you like to pursue as an alternate career path in the future? AH: I really like the fact that I can inspire people with my look, and can be part of amazing creations of people in the fashion industry. As I have a Bachelor in Medicine, I think at some point I will continue with a Masters in Medicine to become a Doctor. IMA: A big part of a model's persona lies in her everyday interests and passions. What are your passions beyond modelling and fashion, and what inspires you in everyday life? AH: Nowadays I am really interested in food and nutrition. Also with my medical background, I am really enthusiastic in reading about nutrition and what food does to our bodies. I am also busy writing a blog about what I know and would like to share with others. My aim is to get my blog online in 2014. My friends inspire me everyday. They are all so motivated and ambitious in life and that gives me a lot of thinking material. AH: Haha eehh... I guess my facial expressions and the fact that my eyes never lie.